Architectural products, like metal screens and infill panels, serve various purposes. All, however, are fabricated to meet practical requirements while fulfilling your creative vision as an architect, designer or brand manager, when you collaborate with Marco Specialty Steel. Learn more about architectural metal screens and an in-depth examination of three of their uses below. Perforated metal: Includes round, square, slotted or ornamental holes in a variety of sizes and configurations. This metal screen option offers privacy and air circulation. Expanded mesh: Features gaps in a specific size and is up to 50 percent more cost-effective than perforated metal, as there is no waste created in the manufacturing process. The versatility of expanded mesh screenings makes it useful to a range of industries. Wire cloth: Suitable for indoor and outdoor screening applications. A variety of different gauges, sizes and weave/crimp styles further add to its versatility. Other types of wire cloth offered by Marco are space, filter, galvanized hardware and bolting cloth, as well as sintered mesh and market- and refinery-grade mesh. 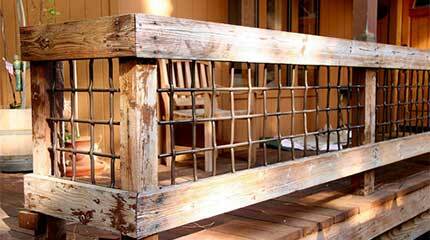 Bar grating: Bar grating has a unique industrial look and exceptional strength and durability. Riveted, welded, press-locked and heavy-duty bar grating is available. Facilities like refineries, breweries, processing plants and storage facilities rely on bar grating to operate. Privacy: Architectural mesh facades keep visitors safe from prying eyes, without the feeling of being walled off. Shade: Architectural metal mesh systems are highly effective at blocking out the sun while still allowing air to circulate freely, keeping guests and their vehicles cool and comfortable. Safety: High strength architectural bar grating gives your guests the peace of mind of knowing the property is protected against unwanted visitors. Noise reduction: Perforated metal and wire mesh facade panels offer some degree of sound attenuation, creating a more comfortable environment for guests. Your team’s creative vision doesn’t limit the uses of architectural metal mesh systems. These systems are versatile and customizable, which allows them to meet your company’s needs. 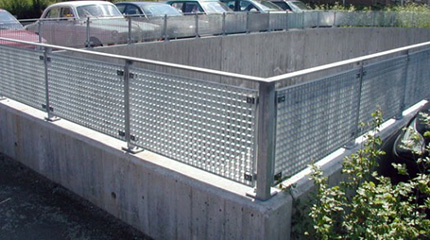 Request different types of metals or gauges to produce a wire mesh or perforated screen for a parking garage. Stainless steel: Offers high strength and is corrosion-resistant. 304 stainless steel, the most common grade used, is made from 18 to 20 percent chromium, 8 to5 percent nickel and no more than 0.08 percent carbon. Nickel alloy: Provides strength and durability, making it a viable choice for perforated and extruded metal, wire cloth and grating. Grades of nickel alloy we work with include C-276 (15.5 percent Cr, 57 percent Ni, 0.02 percent C), Incoloy 800 (21 percent Cr, 32.5 percent Ni, 0.10 percent C) and others. Aluminum: Delivers excellent corrosion resistance and is lightweight. 6061 is the most common alloy for architectural use, particularly the T6 temper, which has a tensile strength of at least 290 MPa (42,000 psi) and yield strength of at least 240 MPa (35,000 psi). 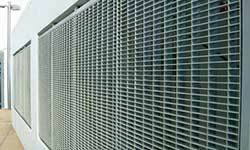 Gauges offered for security screens for parking garages include wire mesh, bar grating and extruded or perforated metal, which are produced from any of the above materials. Powder coat your metal mesh security screen or façade panel in any color, or add a mirror finish to build a product that matches your project’s aesthetic and meets its use in your parking garage. Structure integrity: Architectural infill panels increase your stairwells, walkways or mezzanine’s structural integrity. Perforated metal infill panels are preferred for railings because they’re stronger and offer a cleaner appearance than a non-perforated panel. Protection: Railing infill panels and fencing panels protect your business by meeting building codes. They ensure the safety of guests and employees when using a stairwell, walkway or mezzanine or operating in or near a fenced area. Wire mesh infills: Wire mesh, or wire cloth, is an attractive and affordable option for infilling between railings. We offer several different crimp and weave styles and sizes, including plain, twilled square, twilled Dutch and more. Perforated metal infills: We produce perforated infill panels in round, square and slotted variations, in all IPA standard sizes. On request, we are able to create ornamental perforations in diamond crane, Marietta, Grecian and other styles. 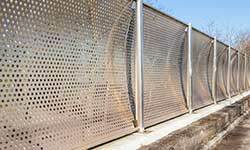 Expanded metal infills: An alternative to perforated metal that involves less waste and material costs. Created by die cutting and expanding a piece of sheet metal to up to 10 times its original size, creating an attractive finished product that is well suited to architectural applications. Bar grating infills: Bar grating offers strength and stability, making it a good choice for structural infill panels. Many designers prefer the unique industrial look it provides. We offer bar grating infill panels in a range of sizes and configurations, including welded, press-locked and riveted varieties. Your metal selection, either 304 stainless steel or 6061 aluminum, is influenced by your panel’s intended use. You may choose 3034 stainless steel, for example, if your railing infill panels will be installed in an environment that has conditions prone to corrosion due to 3034 stainless steel’s corrosion-resistant alloy. If you’re unsure of which infills or metal to use, experienced professionals at Marco will review your blueprints, discuss your project with you and recommend a fabrication that will meet your project needs and provide long-lasting durability. Passage of light: Bar grating panels allow light, air, sound, liquid and heat to pass through their grates. For refineries and processing plants, this feature is essential for the building’s flooring and decks because of the high level of noise and in these facilities. Visual appearance: Outdoor walkways benefit from bar grating panels because they offer an improved visual appearance in comparison to standard bar grating. Our architectural bar panels combine the functionality of standard bar grating with a universal aesthetic appeal. Strength and durability: Any user of an architectural bar panel for walkways wants panels that are strong and durable, especially in tough refinery or plant conditions. Our welded bar grating provides strength and easy installation. Carbon steel: Available in seven different grades that provide additional benefits like strength. The use of certain grades influences the cost of your fabrication. Stainless steel: Stainless steel is the primary material fabricated at Marco because of its strength and resistance to corrosion and is offered in various grades with added alloys. Your architectural bar grating’s application impacts your choice of a smooth or serrated surface. A serrated service is ideal for slippery conditions, while a smooth surface is beneficial for conditions prone to dirt and grime, for instance, because they have self-cleaning characteristics. Options for architectural metal screens emphasize the versatility of this material and its ability to meet every project’s unique needs and vision. At Marco Specialty Steel, we deliver fabrication projects for every need and level of complexity. Our experienced team meets tight deadlines through quick turnaround times at our state-of-the-art, 35,000-square-foot facility. Our fast production times don’t impact the high-quality of our custom metal architectural screen products, which offer durability, strength, versatility and an aesthetic to match your creative vision. View our past work through our Project Gallery or contact us to learn more about our services or discuss your project and request a quote today.